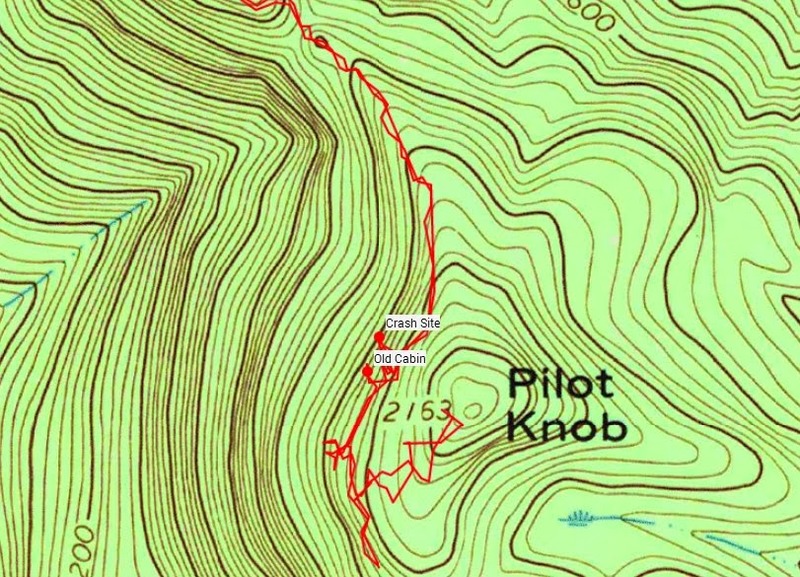 Although I've hiked Pilot Knob mountain many times, I didn't even know that in 1969 an airplane had crashed there killing all 14 persons aboard. A short history of the crash can be found on Wikipedia. This was actually the deadliest aircraft accident in Adirondack history. I had a few hours today to go for a short hike, so I grabbed my dog Rev, and we went to look for it. 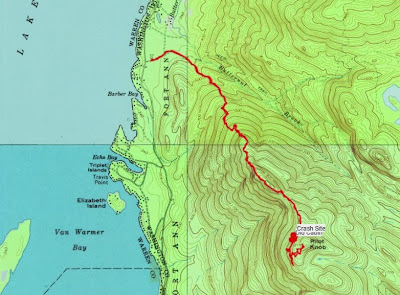 We parked at the Buck Mountain trail head near the near end of Pilot Knob road on the east side of Lake George and were on the trail about 8 AM. It was a nice morning with a fresh dusting of snow and the temperature was about 30 degrees. We took the trail towards Inman Pond for .5 miles before branching right to follow a herd path that leads up Pilot Knob Mountain. At one time, someone had sprayed yellow paint to mark the herd path, and later on, someone sprayed gray paint over the yellow paint to cover it up. There has also been a cairn marking the start of the herd path at various times, but today it was not there. It takes about 45 minutes to climb the steep mountainside to the shoulder of Pilot Knob Mountain. This is where the best views are. and it really is a fantastic place. It's one of my favorite spots. The only problem is that it has a lot of tall grass growing there, and there are a lot of ticks in the warmer weather. It you climb there be sure to check yourself often. Fortunately, today there weren't there. We reached this fine spot to find the early morning sun shining brightly. I stopped to take lots of pictures. I got carried away and took 175 pictures on this short hike. It's nice to have digital. I normally delete about 80 % of my pictures and just keep the best 20 %. There was a mix of clouds and sun when we first got to the shoulder, but on the way back it was mostly sunny. 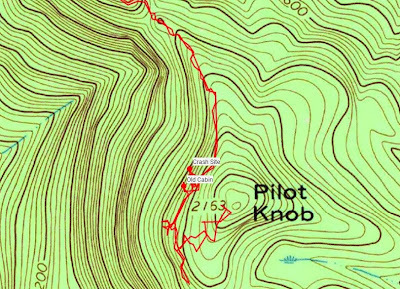 We continued on towards the true summit of Pilot Knob. 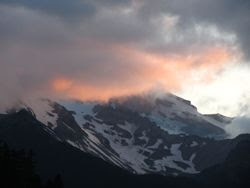 The plane had crashed into the steep cliffs on the western face of the mountain. The cliffs were visible from the shoulder. We were still following the herd path. As we got near the cliffs we passed over a knoll and began a slight descent, I saw the remains of a small cabin shelter on my right. At this point a small side herd path turns to the right and quickly reaches the crash site. I didn't find this until later. I stopped to look at the collapsed shelter and then I continued to follow the herd path straight ahead. After a few minutes, the herd path I was following turned 90 degrees to the left and began to head towards the true summit of Pilot Knob. I knew I had passed the location of the crash, but I decided to climb to the summit since I was close. I had been on the summit before by bushwhacking from the east, but hadn't climbed from the west. The true summit is in the trees. There is a small open ledge to the south. After tagging the summit, we retraced our steps back to the collapsed cabin. It is then that I saw the side path leading to the crash site. I looked around for a bit and tried to envision what had happened at this site in 1969. It must have been truly horrible. I also wondered if the collapsed cabin had been built before or after the plane crash. In any case, we eventually made our way back following our same route. We stopped back on the shoulder to have some lunch and Rev had some dog snacks on top of that. Now this hike is really one of my favorites for the combination of the beauty of the shoulder and the added trek to the crash site. I stumbled on your blog today. My sister Anne was the stewardess for flight 411 that crashed here. Hard to believe yesterday marked 45 years. She had just turned 24 the month before the accident. I still miss her . I hope some day to make the hike and leave her some beautiful flowers. Sorry to hear that. If you haven't been there, and are headed that way, let me know. It is a somewhat hard place to find. I was in high school, in Bolton Landing,at the time.